Bassem Youssef confirmed receiving an arrest warrant on his official Twitter account, mockingly saying he will head to the prosecution office Sunday "unless they [prosecution] send me a police car today and save me transportation trouble." 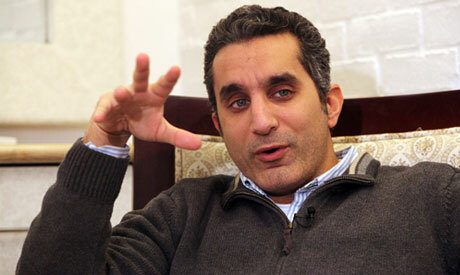 Ealier on Saturday, Egypt's prosecutor-general ordered the arrest of famous political satirist Bassem Youssef to look into complaints accusing him of insulting President Mohamed Morsi, denigrating Islam and spreading false news with the aim of disrupting public order. Youssef hosts a weekly satire show El-Bernameg (The Show) on private satellite television channel CBC. The complaints were filed by 12 citizens after Youssef's 1 March episode in which he mocked the president's public interview with TV anchor Amr El-Leithy in February. In January, a number of Islamist lawyers filed a lawsuit against Youssef, accusing him of "undermining the standing of the president" during his show. What do you mean he is insulting Islam? He is a muslim himself. If the situation arises where freedom of speech is impacted, you will have a civil war. The youth of 21 January were not part of the brotherhood, or any party. They just wanted a free Egypt. This is NOT a FREE Egypt. Bassem hasn't insulted Islam... and saying that he has is just sheer intimidation. You're worse than Mubarak. Elbaradei is muslim, all the contenders to be President were muslim. Why were the MB going around telling others that voting for them (and them only) is a voting for Islam? Why? Whether the MB are in power, or Mubarak is in power, Egypt is an Islamic country. I would caution muslims to think twice about this. Egypt is NOT Tunisia, nor Iran, nor Algeria. We have liberal minded and free minded people. If you oppress their innate need to express their opinions, and do this in the name of Islam, you'll have a big problem. The bigning of the end of MBH ruling time! Where is democrasy and freedom of speach? Sham on you MBH! What if Bassem Youssef insulted Judaism? Would he be arrested? By the same token,Obama shouled arrestThe Golbert Report satirist. Congratulations Egyptians, you have just become another Iran. Next thing you know, Morsi will introduce himself as the hand of God on earth. Do not touch Bassem Youssef. This will be the least of your future trouble. This is a direct threat to our freedom of expression! Why aren't you doing anything about all the terrorists and murderers you call "Islamic clerics" that constantly call for violence and assassinations and accuse others of being infidels and thugs?!?!? I swear, if you so much as charge him with defamation, I guarantee you that the Egyptian street will NEVER rest until you're BANISHED completely from the country!